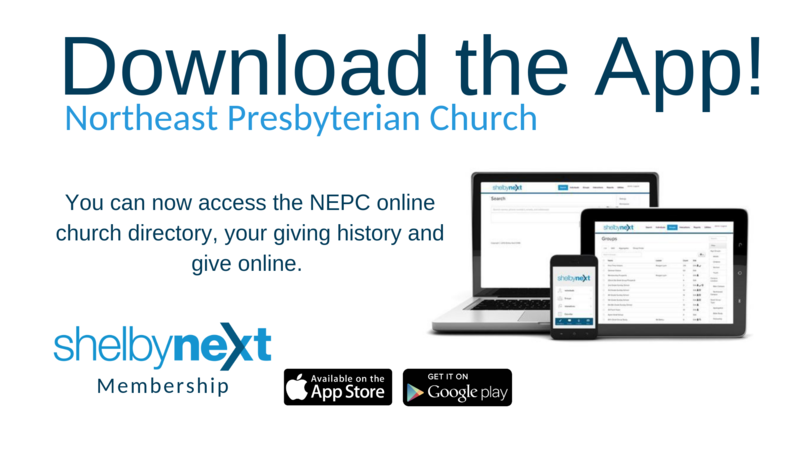 As a member of Northeast Presbyterian Church, you may have access to our online church directory. You can also use the directory to access your giving history and now, to give online . This is accessible through a smart phone, tablet, or computer. Follow the steps below to download it to these devices. 1) Where you see the word “domain” tap on it, and replace it with “nepres“. 2) click on “Forget password?“, enter the email address the church contacted you with in the next window that opens, and click on “OK”. You will soon receive an email with your User Name, and a temporary password. 3) Now, back on the app, enter the username and the temporary password that was sent to you, and click on “Sign In”. Once you have logged in, click on your name at the bottom – this will open the MY DETAILS page. Scroll to the bottom of the DETAILS section, and click on “Change Password” to enter your preferred password. (be aware the password is Case Sensitive). 4) You now have the directory on your phone! 5) If any of the information on the app about you is incorrect, click on EDIT at the bottom of the screen, and make the necessary changes. This will be submitted to our membership director, and she will then make the changes in our records. To access the directory on your computer, you will need an account within our Church Membership system (it’s from a company called ShelbyNext) … and fortunately (if you are a member) you have one! This will take you to a screen like the photo below… simply click on the “Forgot Password” link. In the window that opens, enter the email address that the church uses to contact you. The system will then send you an email with your default username and a temporary password. We suggest you make the username your firstname.lastname (for instance, George.Crow). Change the password to something you can remember, and then you are ready to login!